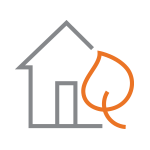 Stop Your Natural Gas Service | Spire Inc. I don’t need natural gas, and I’d like to stop my service. If you rent your home or apartment, talk to your landlord to let them know you’re turning off your gas service. In some cases, we’ll need to physically turn off the gas at your home. If your meter is inside, an adult 18 or over will need to be home. At most times, we can schedule your appointment for the next business day. If you’d like to stop your service online, login to My Account and select the address where you’d like to end your service. You can stop your service online over the phone, too. Just give us a call so we can help.